With so many babies around, expected, and imagined, I’ve decided to adventure into knitting toys. 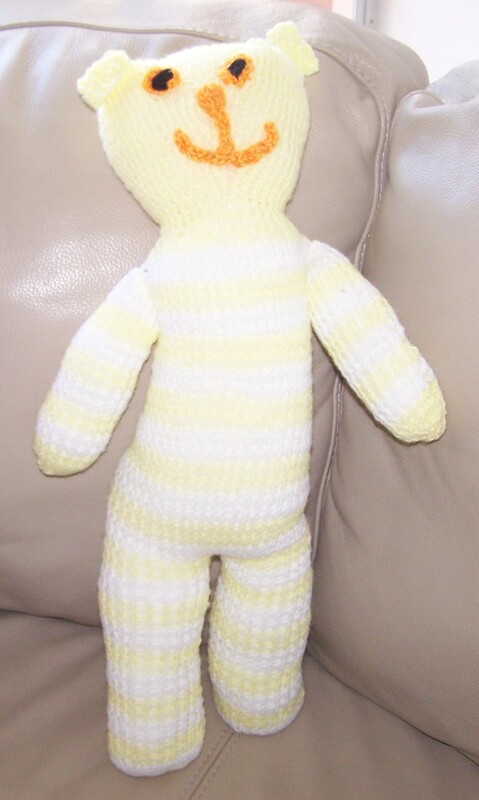 I’ve had the book Knitted Toys by Zoe Mellor for quite some time, but never tried to knit anything from there. I love the book because it is bright, colorful and has great ideas. The directions are easy to follow and it doesn’t look like any of the projects are above an intermediate knitting level. There are charts for some of the projects included. 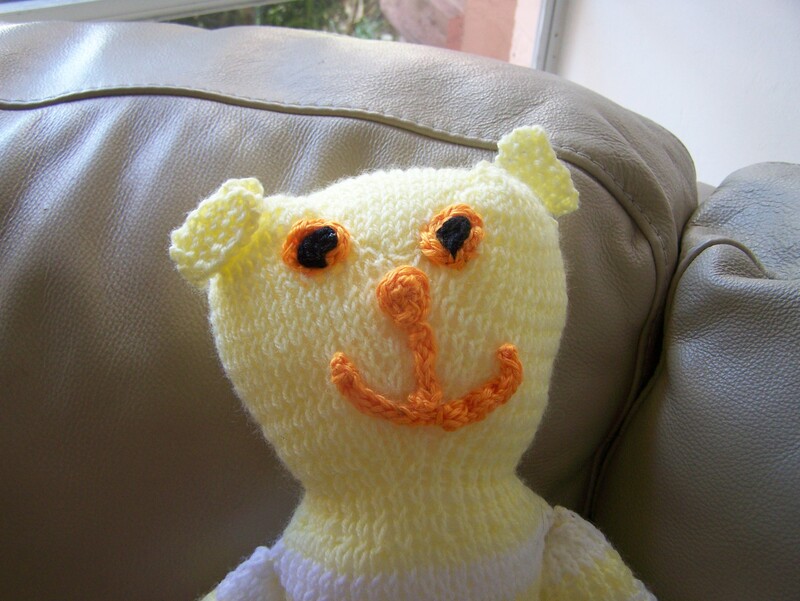 I knit up the Flat Ted (see picture above). I used Lion Brand Baby Soft which was a mistake. I probably would have been better off doubling up the yarn or using a smaller needle. The size six needle created two large of a gauge. It still is cute but could have looked much better and was hard to embroider. After two attempts at creating the face, I gave up and decided to create icords out of Caron Simply Soft Orange and Black that I had lying around. I think it looks okay, but it could certainly look better. Many of the patterns included in the book call for Jaeger Baby Merino. One such pattern was the Squeaky Pig which I desperately want to make if I can find the right yarn. I have searched online but can’t find this yarn anywhere. I have a feeling it either no longer exists or is only available in Germany. This is a fun book with great ideas. Maybe I’ll use scrap yarn to make the snake next. I need more stuffing! Tomorrow is Memorial Day and the unofficial start of summer. In Southwest Florida, it has been summer for about a month now. The days are above ninety degrees and no one wants to spend time out in the summer. While the pool looks appealing, the air-conditioning is much more comforting. I’m about five inches into my light summer scarf/shawl after a week’s worth of work. I should have this done by Labor day if I’m lucky. Once it is completed, it’ll be my favorite summer accessory. The warm weather is a good time to work with lightweight materials such as cotton, linen, silk and bamboo. I’m using very, very fine wool. I’d love to make a skirt out of linen, but right now I don’t have the budget or the time to cover such a large project. Summer is a great time for reading for those of us who love to delve into a novel while relaxing pool side or beach side. I recently finished The Help by Kathryn Stockett. This is something that I could not put down. If I only had five extra minutes in the morning before rushing off to work, I spent those few minutes perusing a few more pages. This is a story of the maids who work in the deep south in the early sixties and the families that they take care of. If you like reading, go out, buy or borrow this book and tell your friends. I hope that this will change how we think of people and class structure. Society has changes but in some ways, it never will. Kathryn Stockett allows the reader to empathize with Miss Skeeter – the upper class white woman who decided to write the stories of the black maids, as well as the maids themselves, Minnie and Aibileen. I read this in five days despite work, school and even a guest visiting (read a few pages, talk a bit, sneak back to read another page). This one will definitely win awards and hopefully be discussed in classrooms as part of regular curriculum some day. I have a two week respite from classes before returning to the overwhelming summer schedule. I have been focusing on school and other things and have taken a break from knitting. Like all hobbies, sometimes people just need to take a moment to reorganize. My felted bag has an issue that I have to fix and the chunky shawl is short of yarn. A lot of times when you have a large project and run into a problem, it is easier to simply put it aside and take a break. Most of the time, that problem remains in the corner for months or even years. Then, all of a sudden, the light will go off and you’ll pick up the needles with fervor, onto the next great idea. Instead of writer’s block, this seems to be more of a knitter’s block. It’s easier to leave everything alone until I get that desire back. In the meantime I want to indulge in books, movies, writing, and guiltily- the Sims 3. I know it is terrible and unproductive- but I love the game. I’m trying to keep this to a minimum because it is easy to get lost in the imaginary world of the people I create and control. Why put all the work into writing myself, when I can make my character do it and make money on it in my world. Right now, I am enjoying The Pillars of the Earth by Ken Follett. I am only about 150 pages into the grandiose novel but I am enjoying it. His story is set in 12th Century Europe. The characters are interesting and fluid. The plot is thick but intriguing. Tom Builder and his family are traveling across England trying to find work, preferring to work in Cathedrals. Prior Phillip is a genuinely pious priest but also a proven leader despite his youth. He becomes engulfed in the politics of his day. I still have a long way to go in the novel but am looking forward to it. A while ago I was at the library, wandering around, when I discovered these little playaway books on preloaded mp3 players. First of all, I am one of the few people out there who do not have an ipod or an mp3 player or even a smart phone. I found these little devices that have one book recorded on it, and that you can borrow for three weeks at a time (longer if you are a chronic renewer like me). I listen to them at work, at the gym, and while knitting. So far I’ve listened to Marley & Me, Songs of the Hunchback Whale, Blue Diary, and Water for Elephants. I started The Time Traveler’s Wife but it bored me. I couldn’t stand the speaker for Beach Road. I’m currently listening to The Wednesday Wars, which is directed at children, but is written (spoken) well and is a perfect cutesy book to have at work. My next one will be The Joy Luck Club. I’ve read most of these before with my absolute favorite being Water for Elephants by Sara Gruen. The narration is split between the 90 or 93-year-old Jacob Jankowski and his 23-year-old memory. He described both his life at a nursing home, his aging body and loneliness at a point when his children are too old to take care of him. Across the street, the circus is setting up and a fellow resident begins to claim that he used to carry water for elephants. Jacob becomes angry at this, saying Mr. McGuinty is a lyer. A nurse, Rosemary, takes pity on him and begins to treat him like a human being instead of another body. We listen to him tell about being 23, days away from taking his final exams in Veterinarian School at Cornell University when his parents are killed in a car accident. This occurs during the Great Depression. Jacob finds out that the bank is foreclosing on his parents’ home and goes to take the finals. He walks out of the room without answering a single question. Fate takes him to the railroad tracks where he jumps into a car only to find out that he’s on a circus train. The rest is an adventure. Jacob discovers circus life and the meaning of love for both the beautiful Marlena and the surprising elephant Rosie. This is an absolute must read- or listen. There is even a movie in the works, which is planned to come out in 2011. Songs of the Humpback Whale was also a fantastic experience. Listening to it was even better because there are five narrators in five voices. I believe that this brings it to life far more than actually reading it could- and Jodi Picoult is a great writer. This is a journey of self discovery by five very different people who are connected by life and events that are beyond their control. A mother, father, daughter, uncle and lover all reflect on the actions that take them to a quaint apple orchard in Massachusetts. While listening, you salivate at the description of the crunching apples, shiver when the cool northeastern winds blow, and feel the characters as if they are standing next to you.